Batesville is a small community in the southwestern part of Albemarle County at the intersection of Plank Road, and Craig's Store Road. It has two country stores and a post office. The town also has several community gatherings organized by the Batesville Ruritans, including Apple Butter Day and Batesville Day. On Batesville Day there is a parade, reportedly the smallest in Virginia, a 10 kilometer race, and other activities. It is also known for its campaign to encourage drivers to obey the 25 mph speed limit within the town. Batesville is near Bundoran Farm, a preservation development being developed by QRoe Farm. 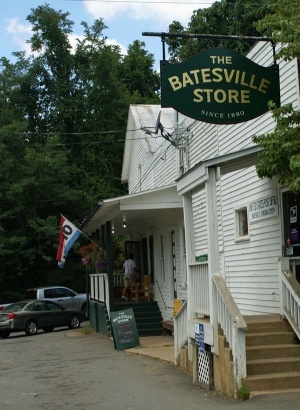 The Batesville Market is a country store located on Plank Road. The building was built in 1900 and has hosted many businesses, including the Charles Joseph Store, the Page's Store, the Batesville Store, the Plank Road Exchange, and finally the Batesville Market. ↑ Web. The Batesville Market, WordPress, retrieved March 25, 2019. This page was last edited on 25 March 2019, at 11:40.